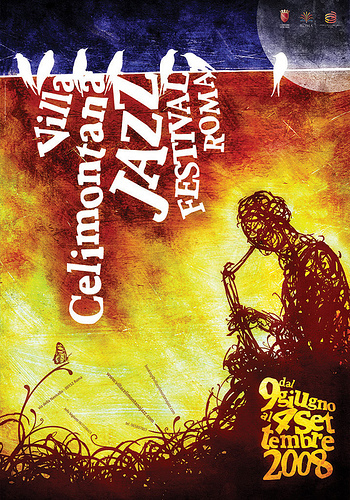 Why would you not illustrate a jazz festival with a certain aesthetic? Why wouldn't you use a conservative 'American country club' serif font in gilt, with mahogany highlights, to illustrate a jazz festival? I don't mean an ironic aesthetic, but the real thing - uptight and frankly bad. Why wouldn't you do this, and what would happen if you did? I will come back to that last question. I am interested in the aesthetic 'force fields' connected to cultural forms, or for that matter any kind of activity...systems of aesthetic orthodoxy, at the edges of which we find the limits of acceptability and the point where the apparent aesthetic permissiveness of the genre or practice is shown to be anything but. The vigour with which such system are protected against 'corruption'. We can look back in time and think of the Futurists or the first Bauhaus students as idealistic and in some way understand their zealous protection of an aesthetic objective. Somehow I understand, and I sympathise. More than this, I 'get it' visually - I instinctively know when something is 'not Bauhaus-like', even if such a thing is absolutely impossible to define, and I might in fact get it completely wrong. Still, I know that there is a syntax and a system, and that there are rules that extend well beyond the visual or aesthetic. These rules are social and cultural as much as they are aesthetic, in fact. Which leads us back to this question: what happens if you transgress, if you move beyond the limits of acceptability for a given form or activity? Well, that's pretty straightforward. Ostracism: expulsion from the tribe.